1st) Supply you with ‘Tour Options’ designed to give you the most out of your Tour or work with you on a tour plan that you selected from another source. 2nd) Produce and Supply informative Tour Flyers listing the cost, due dates for deposits and what is included in the tour. 4th) Collect and distribute all deposits and payments. 5th) Accept all forms of payment, including Credit Cards. 6th) Contract & coordinate bus (Coach) service in the States. 7th) Contract Hotels and Restaurants in Ireland. 9th) Contract the Coach (Bus) service in Ireland. 10th) Keep Travelers updated on FAA and TSA requirements and changes. 11th) Produce a web page for your group’s Tour, including the Cost, Itinerary and What is included. 12th) Supply your group a seasoned Tour Guide that will stay with the group throughout the Tour. 13th) Guarantee the Tour with 2 paying travelers. We won’t cancel a tour. If you fail to promote your tour we reserve the option to sell positions on your tour to fill said Tour. Positions sold by us will not count towards your group's promotions, performance or rebates. 14th) Guarantee the Tour’s cost per person in US Dollars. 15th) Respond to all your traveler’s questions. 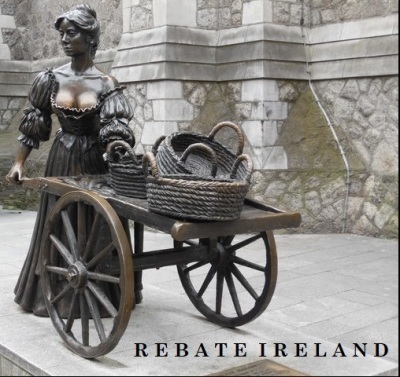 16th) We agree that if you the tour organization (Group), register 20 paying travelers for the tour, Rebate Ireland will make a donation of $4,000. When the tour organizer reaches a total of 41 paying travelers we will increase our donation by an additional $8,000 for a total of $12,000. 17th) When the total number of paying travelers reaches 20 you will receive a FREE full tour package including airfare. NEXT, If you agree to..